Vangas are essentially birds of primary forest, like most other endemic Malagasy species. This means that they are ab sent from most of the high plateau region, and in coastal areas, essentially absent from secondary forest, plantations, or built-up areas. The two exceptions to the rule are hook-billed and Chabert's vangas. The latter may be found in degraded and secondary plantations a fair way from primary forest, where it appears to be able to hold territories and breed. Chabert's vanga is very mobile and may visit plantations (especially eucalyptus or mango) in search of pollinating insects tens of miles from primary forest. But neither has ever been recorded, for instance, from the centers of the larger cities. The more adaptable species (hook-billed, Chabert's, white-headed) are found in all types of primary forest (eastern rainforest, western deciduous forest, and southern spiny subdesert), although populations in different forest types are subspecifically distinct in all three species. 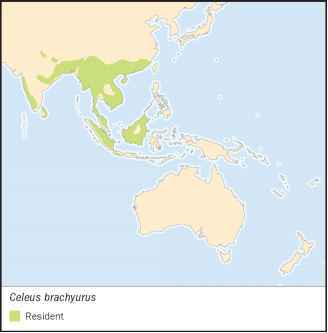 Blue, rufous, and Tylas vangas are found in both east and west; they are all restricted entirely to primary forest, and rufous and Tylas van-gas have different subspecies in the west. The sicklebill occurs only in the west and south, although it manages to get by in the northern parts of the east, where forests are transitional. All the other species are limited either to southern spiny sub-desert (Lafresnaye's, red-shouldered), western deciduous (Van Dam's), or eastern rainforest (Pollen's, Bernier's vangas, helmet vanga, and nuthatch vanga). The latter three species seem to be limited to the lower elevations in the rainforest, and helmet and Bernier's vangas to the northern half of the rainforest belt. Pollen's vanga seems to be much more common in the southern half of the rainforest than the north, and may be more common at higher altitudes. Hypositta perdita, described recently from juvenile specimens, is only known from rainforest at low altitude in the far southeast.